Our work is directed at unraveling the role of caveolin-1 as a novel mediator of cellular senescence. Caveolin-1 is the structural protein component of caveolae, invaginations of the plasma membrane involved in signal transduction. Caveolin-1 acts as a scaffolding protein to concentrate, organize, and functionally modulate signaling molecules within caveolar membranes. Our laboratory was the first to demonstrate that caveolin-1 plays a pivotal role in oxidative stress-induced premature senescence. We found that oxidative stress upregulates caveolin-1 protein expression through the p38 MAPK/Sp1-mediated activation of the caveolin-1 gene promoter. We also demonstrated that caveolin-1 promotes premature senescence through activation of the p53/p21Waf1/Cip1 pathway by acting as a regulator of Mdm2, PP2A-C, TrxR1, Nrf2 and Sirt1. Moreover, we found that caveolin-1-mediated premature senescence regulates cell transformation and contributes to cigarette smoke-induced pulmonary emphysema, directly linking caveolin-1’s function to age-related diseases. Taken together, our findings indicate that caveolin-1 plays a central role in the signaling events that lead to cellular senescence. Our current main research interest is the identification, at the molecular level, of novel signaling pathways that link caveolin-1 to oxidative stress-induced premature senescence and their relevance to aging and age-related diseases using both cellular and animal models. These investigations will provide novel insights into cellular and molecular mechanisms underlying aging and cancerous cell transformation and will identify novel molecular targets that can be exploited for the development of alternative therapeutic options in the context of age-related diseases, including cancer. Volonte D, Zou H, Bartholomew JN, Liu Z, Morel PA and Galbiati F. Oxidative stress-induced inhibition of Sirt1 by caveolin-1 promotes p53-dependent premature senescence and stimulates the secretion of IL-6. J Biol Chem 290:4202-4214, 2015. Volonte D, Z Liu, PM Musille, E Stoppani, N Wakabayashi, YP Di, MP Lisanti, TW Kensler and F Galbiati. Inhibition of nuclear factor-erythroid 2-related factor (Nrf2) by caveolin-1 promotes stress-induced premature senescence. Mol Biol Cell 24:1852-1862, 2013. Zou H, D Volonte and F Galbiati. Interaction of caveolin-1 with Ku70 inhibits Bax-mediated apoptosis. PLoS One 7:e39379, 2012. Volonte D and F Galbiati. Polymerase I and transcript release factor (PTRF)/cavin-1 is a novel regulator of stress-induced premature senescence. J Biol Chem 286:28657-28661, 2011. Hezel M, de Groat WC and Galbiati F. Caveolin-3 promotes nicotinic acetylcholine receptor clustering and regulates neuromuscular junction activity. Mol Biol Cel 21: 302-310, 2010. Bartholomew JN, D Volonte and F Galbiati. Caveolin-1 regulates the antagonistic pleiotropic properties of cellular senescence through a novel Mdm2/p53-mediated pathway. Cancer Research 69:2878-2886, 2009. Volonte D, B Kahkonen, S Shapiro, Y Di and F Galbiati. 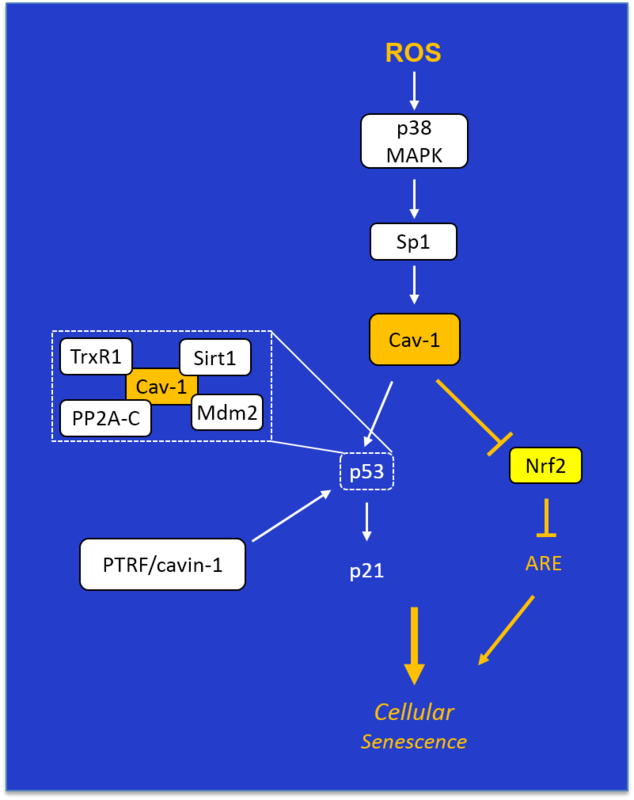 Caveolin-1 expression is required for the development of pulmonary emphysema through activation of the ATM-p53-p21 pathway. J Biol Chem 284:5462-5466, 2009. Volonte D and F Galbiati. Inhibition of thioredoxin reductase 1 by caveolin-1 promotes stress-induced premature senescence. EMBO Reports 10:1334-1340, 2009.